San Diego is the 8th largest city in America. San Diego is known for it’s predictable mild year round climate, it’s beautiful beaches along the Pacific Ocean, and array of outdoor activities available to residents and visitors alike. Population estimates for 2012 were approximately 1,333,000 persons. That number is expected to increase steadily for the foreseeable future. Major Colleges and Universities are San Diego State University (SDSU), University of San Diego (UCSD), University of San Diego (USD), and Point Loma Nazarene. The Economy is driven primarily by Defense and Military, Tourism, International Trade, Manufacturing and Research, and Real Estate. San Diego remains incredibly popular as one of the top places to own real estate because as the old saying goes: Location, location, location. Its truly is like living in paradise in San Diego. Columbia District, Most expensive neighborhood in Downtown San Diego. All residences sit along San Diego Bay and PCH. Gaslamp Sign at Night in the Heart of the Gaslamp. Core District (Mostly Commercial), the central business district of downtown. Cortez Hill, Residential and some business. the north-east area which borders the freeway. Views of San Diego Bay, the city, and the ocean. East Village, Popular for living and investment properties. Younger area and Downtown San Diego’s newest district, home to Petco Park and the surrounding Ballpark Village. 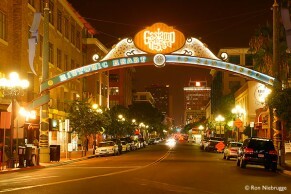 Gaslamp Quarter, Several residential options set in the heart of the night life district with restaurants, shopping, and nightclubs. Little Italy, Many mid-rise and several high-rise buildings. Italian dining at it’s finest is located here. the north-west district of Downtown San Diego. 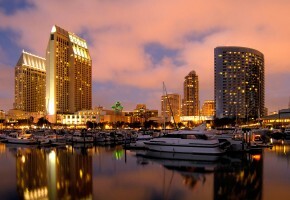 Marina District, The most popular residential area to live in Downtown San Diego. The south-west district of downtown, which is home to Seaport Village and Pantoja Park. Downtown San Diego has changed tremendously since 1999. There are many wonderful options now for city living at it’s finest. There are options in just about every size, configuration, location, style, and price point. From High-Rise luxury residences to economy sized lofts, there is something for every one. La Jolla Farms – This is one of the most picturesque neighborhoods in La Jolla and holds some of the most exclusive homes in all of San Diego. A northern La Jolla neighborhood including the famous Torrey Pines Glider port, the Salk Institute, and a group of expensive homes on the cliffs above Black’s Beach. 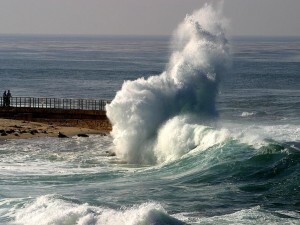 La Jolla Shores – Residences include beach cottages, modern homes, and condominiums. There is a small business district of shops and wonderful restaurants along Avenida de la Playa. Also, true sandy beach access is available here. La Jolla Heights – All beautiful homes on the hills overlooking La Jolla Shores. All residences and no businesses. Hidden Valley – This is the lower portion of Mt. Soledad on the northern slopes. Some residential options here but no businesses. Muirlands West – This is the all residential small neighborhood between Muirlands to the south, and Country Club to the north. Upper Hermosa – Many confuse this area with North Pacific Beach but is actually is the Southwestern part of La Jolla, north of Bird Rock and east of La Jolla Blvd. La Jolla Village – Many confuse this area as one in the same as Village. A simple way to remember is La Jolla Village is NOT coastal at all. The Village is a fully and complete coastal town. Very different areas. The neighborhood’s namesake is the La Jolla Village Square shopping and residential mall, which includes two movie theaters. La Jolla is home to some of the finest and most luxurious homes in San Diego. Price points vary greatly and there is something for everyone. La Jolla should be high on every list when searching real estate in Coastal San Diego.